Sometimes life hands you a moment that allows you to forget your existence. Pressing bills, strained relationships and demanding careers become a distant memory, dissolved by a chance to savor the flavor of bliss. In my case, a moment with friends old and new at Cincinnati's undisputed best restaurant became the zenith of surrealism. It's no secret that the Queen City's only four-star restaurant is closing its doors next Saturday, February 28 after what appears to be a disagreement and divorce of sorts between Jean Robert de Cavel (the man with the ideas) and Martin Wade (the man with the money). My darling friend Julie had heard rumblings about a potential split for months and has more information here. Almost exactly a month ago, Jean Robert at Pigall's revealed it was closing its doors, one day after Mobil announced it awarded the restaurant with it's fifth four-star award - the only four-star restaurant in Ohio, Kentucky and Indiana. I immediately called and booked a table for eight. I had no idea who would be dining with me, I had no idea what unexpected financial obligations would arise, but I was certain I would make this spectacular dining experience happen. I have always regretted missing out on dining at the fabled Maisonette, Cincinnati's (and the nation's) longest running five-star restaurant, at a spectacular 41 consecutive years. As a foodie, it is a regret I don't take lightly, and so that's why I was quick to jump on the reservations for Pigall's. I am grateful for the quick thinking, as now you cannot get a reservation at the place - there are so many people who are clamoring for their final taste of greatness. Our table was made up of an eclectic group of old and new friends - folks who signed up for the dining excursion from the beginning and some folks who opted to join our table just hours before our meal. Rusty and the Divine Ms. M, Jos, Sweet, and I were joined by our friend (who also happens to be a chef in Cincinnati and is apparently adored by JRdC) and also the lovely Sara and Evan (who goes by @nth_degree on Twitter). We walked in to Pigall's and were greeted with a genteel refinement from another time and place. The hostess graciously asked us for our coats and Richard the Maitre d' directed us to a glittering, round table adorned with candlelight, gleaming silverware and salmon orange linens reminiscent of a steamy sunset in July. Richard pulled out my chair for me and gently pushed it back in as I sat, basking in the surroundings - I am certain the space is designed to look like a dining room in heaven. Rusty remarked that we were about to dine like Gods - and we were, because the table decided together that we would choose the five-course Menu Gourmand with matched wine pairings. The meal itself was $97 a person, the wine pairings an additional $37. The entire experience was worth every penny. A fleet of servers placed our amuse bouche before us, a gift from the chef - a demitasse of beet soup, an eggy mousse concoction and a phyllo dough purse filled with I believe duck confit. I must confess, the meal was a spectacular crescendo of one dynamite course after another, and so it's hard to remember every single detail. I assure you, there wasn't a moment I disliked. After the amuse bouche, our server directed the attendants to bring us our first course - a sort of vegetable cole slaw laced with savory bits of Maine lobster, ruby red grapefruit pieces, and tiny pearls of pomegranate that served as the exclamation point of the dish. The table's conversation was replaced with moans of delight and declamations of pleasure. The army of attendants whisked away our dishes and we prattled on in complete happiness - at this point it was obvious all of our cares had been washed away, if for even this brief moment in time. 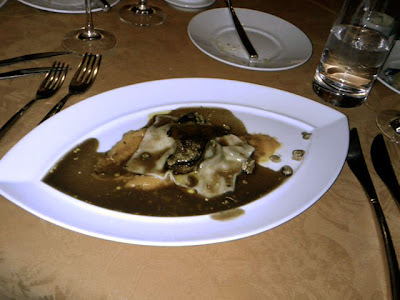 My dinner guests and I debated at the end of the night whether the second course was the best of the evening - seared foie gras atop a ravioli filled with duck, adorned with candied pecans and laced with pureed sweet potatoes. In my 32 years of life and rich experience, I have never tasted anything so delicious. I think back to memorable meals I've had in Cincinnati and Boston and Louisville and Paris and London, San Francisco and elsewhere. I don't think anything trumps this foie gras - what with it's buttery smooth flavor - not gamey, but more nutty, salty and extremely savory. I know there's an ethics issue here, what with the forced feeding a duck experiences to produce such spectacular foie gras, and I will say I am extremely grateful for the duck I enjoyed and was especially reverent while savoring the sacrifice of that animal's life. Our conversation drifted in and out of irreverence as we talked about other nice restaurants in town, some of the gossip in the industry, and other juicy topics. We tossed out our speculations about JRdC's future - one diner said she had heard through the grapevine there might be a non-compete forbidding JR to stay in town. Another diner who has some significant connections says she assured us that was not the case. After the second course, we were all crestfallen at the thought this man's brilliance may leave Cincinnati. As I mentioned earlier, we had a chef dining with us that evening - a chef who JR is apparently fond of. 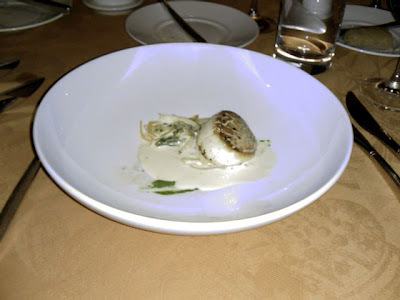 Our table enjoyed a special, extra course of a massive diver scallop drizzled with a creamy, buttery sauce laced with anise. I could smell the sea as soon as the scallop was placed in front of us - a similar quality I noticed when I reviewed Honey for a local magazine last autumn. That particular scallop was served atop braised pork belly and a parsnip puree. If memory serves me correctly, JR's scallop was a showstopper on a bed of cabbage. We enjoyed this unexpected addition, wondering how the remaining courses could outdo anything that had already passed our lips. 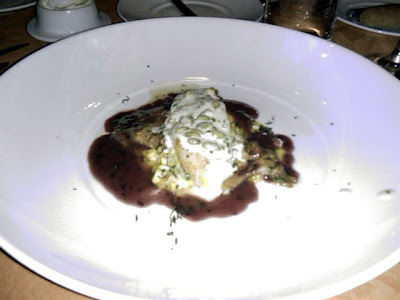 For the next course, Chef served up black cod drizzled with truffle sauce and a blue cheese fondue. The fish sat atop a medley of vegetables that included corn kernels still side by side as they were during their days on the cob. The tines of my fork pulled the fish apart easily - it was full and fresh and flaky, and I loved every bite of it. The table sat in anticipation, reflecting on the courses already enjoyed and anxious for what was to come. I was a bit curious about the next course. 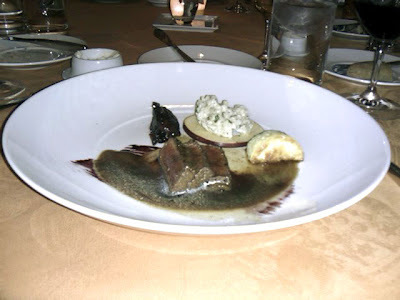 I'd never dined on elk before, and was looking forward to discovering the flavor of this rare meat. Would it be gamey? Would it be tough? I wasn't really concerned, I have a streak of Anthony Bordain in me, having dined on black pudding in Scotland and raw beef in none other than Covington. I was looking forward to the opportunity of Elk. The elk glimmered like an oblong ruby sliced into petite medallions. My knife gently cut through the tender meat - which had the flavor of the heart of a really well cut fillet. The dish also included an apple slice adorned with a sort of barley risotto, a lentil flan and the most delicious cranberry flavored chutney. Let us now observe a moment of silence to revere the divine. Highly inappropriate for a four-star restaurant, I was dying to lick my dish, savoring every last bite, lick and taste on the plate. The attendants took our plates and the server offered us a glass of Jean Robert's house champagne in anticipation of our dessert assortment. 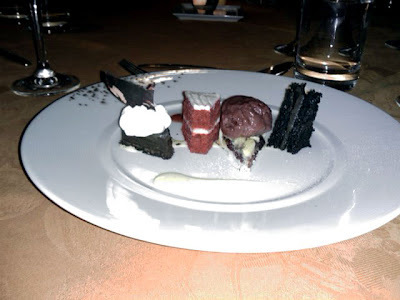 Quickly, our places were graced with a medley of pomegranate sorbet, chocolate mousse, red velvet cake, pear tart and chocolate cake. 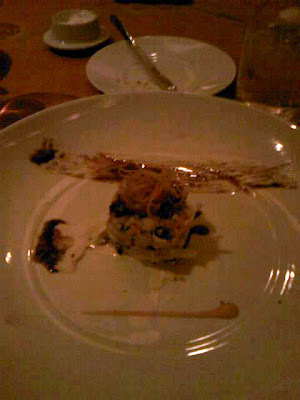 Every sweet bite was a perfect finish to our meal, which was a perfect way to toast a grande dame goodbye. My moment at Pigall's was a sublime, sensual experience. It made me forget the chores and challenges of my life, which is exactly what any moment of fine dining should aspire to invoke. Good luck finding that at Applebee's. Special thanks to Evan for the photos.